It's been a weird season so far. Last night was the fifth time this season that Marquette won the eFG% battle and still ended up losing the game (Butler, UWGB, @GU, @Nova). Because eFG% is so important, this does not happen very often. The easy culprit to point to is the offensive turnover rate, where Marquette turned the ball over on one out of four possessions last night. However, when we dig into the season a bit more, the answer is slightly more nuanced. 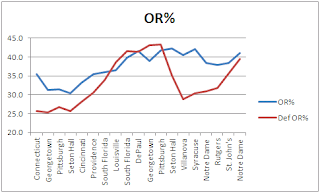 The chart above is a moving five game average of the season starting with the game against UConn. One way of looking at it is that Marquette can be inconsistent, but settles into an offensive efficiency range of between 105 and 115 (remember, '100' is average). 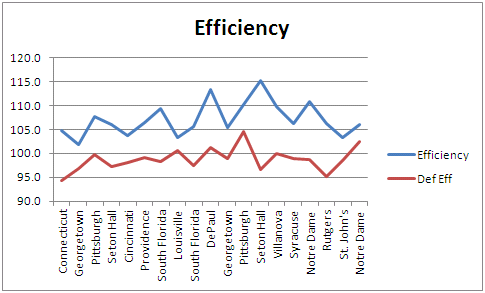 During conference play, #mubb still had the best offensive efficiency in the Big East with an average of 107. Another way of looking at the offensive numbers is that Marquette has been sliding since the Seton Hall game. The defensive numbers show an average defensive efficiency of about 100. However, those defensive numbers are getting worse close to the end of the season, which should be disconcerting. Unfortunately, the most concerning part of this chart is how close the offensive efficiency and defensive efficiencies are to each other. Teams that have offensive and defensive efficiencies that are close to each other are 0.500 teams. Of course, since efficiency can be broken into The Four Factors (eFG%, TO%, OR%, and FTR), how have those trends looked? 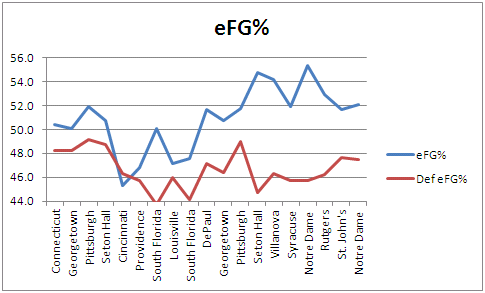 Below are the trends for eFG%, TO%, and OR%. I am leaving out FTR, because it's irrelevant (repeat after me: FTR is irrelevant). The eFG% is probably the most promising chart of the entire set. 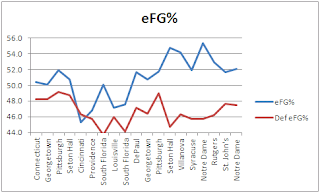 Marquette's eFG% has been improving throughout the season. Despite a decline from the first ND game, it's still at a healthy level. More importantly, the defensive eFG% is reasonably stable, AND there is a nice gap between the two trends. Because eFG% is so much more important than any other factor, this should give some cause for optimism. Turnovers... yes turnovers. This chart is entirely upside down. One always wants the defensive turnover number to be higher than the offensive turnover number. In addition, typically the turnover rates get better as the season goes on. Unfortunately, we see Marquette's turnover rate continuing to get worse and settling in at around 24%. That means, on average, Marquette turns the ball over one out of four trips down the court. However, here's where the nuance comes in. Marquette's defensive turnover rate has been even worse! For a long stretch of the season, both rates trended closely together. 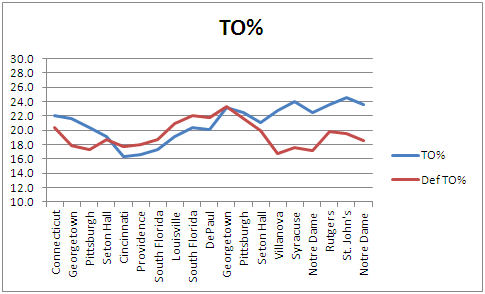 However, since the second GU game, Marquette's ability to force turnovers has declined significantly. Opponents now turn the ball over about one out of every 5-6 trips down the court. In other words, it isn't just Marquette's sloppiness with the ball that is hurting... it's also the lack of forcing turnovers as well. Consider that while the Warriors had a turnover rate of 25% last night, the Puking Shamrocks only had a turnover rate of 11%. That's one out of four trips vs one out of ten trips, respectively. Finally, here's the additional bit of nuance. 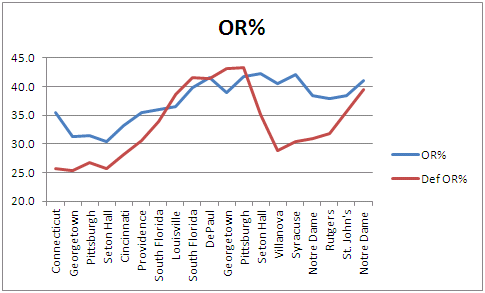 Similar to turnover rate, OR% (offensive rebounding rate) was trending fairly close together for most of the season. In fact, our defensive rebounding was worse than our offensive rebounding up through about the Pitt game. Then there was a strong improvement defensively while offensive rebounding for MU stayed strong. 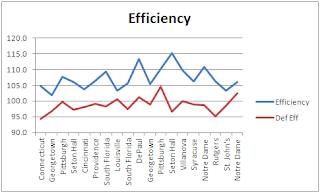 This was how Marquette was able to win games... with better eFG% and OR%. However, since the Villanova game, defensive rebounding has been worse and worse and now no longer masks the turnover deficiencies. I almost called this post "The Four Charts of Doom". It shows that the offense has been suffering due to some worse eFG% and a steadily worsening turnover rate. However, it also shows that the defense has been getting worse because of both less turnovers forced and less defensive rebounds. However, I think that there are several paths for optimism. While it remains unlikely that Marquette will turn into the 2009 or 2010 Marquette teams that were AWESOME at protecting the ball, if Marquette is able to either force more turnovers or dominate the defensive boards, then the team may still be able to make another path to the second weekend of March. If there's anything we've learned, it's that Buzz can spin all kinds of magic with his coaching.